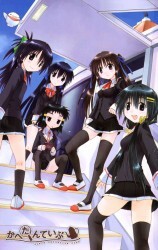 Synopsis: Tsubamegaoka Private Academy - All Girls' High School, located just inside the city and has clubs a plenty. From the common ones to some freakishly impressive ones, it varies greatly. It's always okay to make one, no matter what kind of club. It's not uncommon to see students join this school for the sole purpose of making a new club. But what happens when five girls want to make a club and only one new club is allowed? Cahe Detective Club happens! Chapter 39: "The Mania Does Not Stop"